I have been on a Mexican food kick ever since we left LA and all the tasty Mexican restaurants behind (sad face.) I got this recipe from Designer Bags and Dirty Diapers for the tacos with a few tweaks and came up with the rice based on what we had in our cabinet. I think the end result was pretty tasty! -- Place shrimp in a bowl and toss with a few teaspoons of canola oil, a few teaspoons of hot sauce and salt and pepper. Let sit for 15 minutes or so. -- Meanwhile, dice and chop all other ingredients and heat oven to 350. -- Mix 1/3 cup of sour cream with half of a packet of taco seasoning. -- Heat tortillas in oven for no more than 5 minutes. -- Saute shrimp in two teaspoons of canola oil for about 4 minutes, until pink. 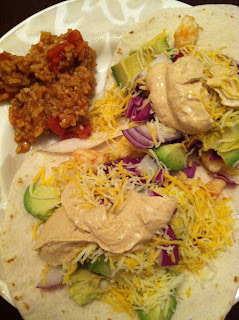 -- Add all the ingredient to a tortilla and top with sour cream topping and a squeeze of lime! -- Add chicken broth and rice to saute pan and cook for 3 minutes. -- Add tomatos, salt and pepper and remaining half of taco seasoning (see above) and cook, stirring often for five minutes.